British professionals are less career-focussed than their American peers and are also far less likely to use social media to build their networks, share knowledge and look for jobs, new research from YouGov reveals. The study among employees in the United States and the United Kingdom found that British workers are less savvy when it comes to furthering their careers through social media. 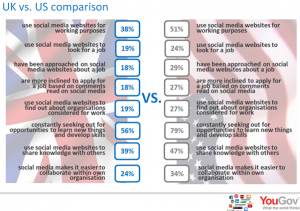 Fewer than four in ten (38%) professionals in the UK use social media for work purposes compared to more than half (51%) of their American counterparts, while around a fifth (19%) of British employees have used social media to look for a job, compared to almost a quarter (24%) or US professionals. The research found that British workers are much less driven in pursuing their career goals than their American counterparts. Some 56% of UK employees are always on the look-out for opportunities to learn new things and develop their skills, a figure that pales against that for American professionals (79%). Furthermore, employees in the US are much more likely to know where they want their career to be in five years’ time and how they’re going to get there (55% vs 40% of UK workers). This lack of defined ambition among British employees manifests itself in a more passive approach to career development. While a third (34%) of American professionals would prefer to move on instead wait if their employer doesn’t offer progression within an acceptable timeframe, just over a quarter (26%) of British workers would do the same. Despite being less engaged with social media generally, British employees are more active on LinkedIn than their American peers. Almost seven in ten (69%) UK workers have used LinkedIn for professional networking in the past month compared to just six in ten (60%) professionals across the Atlantic. Additionally, YouGov found that while fewer than one in five (18%) workers in the UK have been approached on social media about a job, this figures increases to just under three in ten (29%) employees in the US. 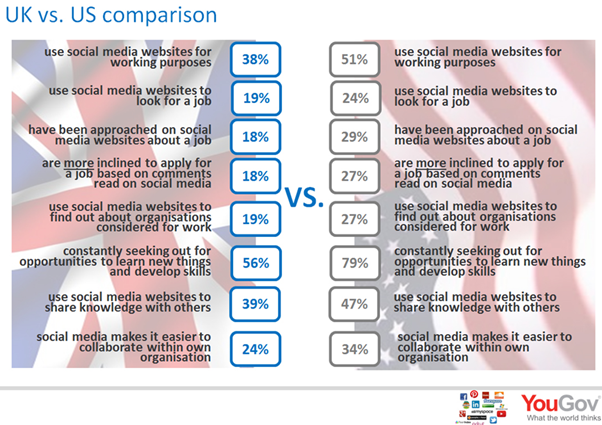 American professionals are also more likely to use social media to share knowledge with others in their field (47% vs 39%), and to agree that social media makes it easier to collaborate in their own organisation (34% vs 24%). Am I the only one thinking that LinkedIn and the like are vastly over-hyped as a way of developing your career? I have used social media for years now, but have found little value from it professionally. I have heard so much breathless enthusiasm for social media, but is it really just a case of the Emperor with no clothes?